If the notion of eating borscht or beets in any form makes you sad, get ready for a tremendous upgrade. You’ll be delighted to learn that there is a perfectly wonderful way to enjoy this very healthy vegetable which is so rich in folate, manganese and fiber. As their intense colour would suggest, beets are big-time on antioxidants, and have cancer and heart disease-fighting properties, as well as a host of vitamins and minerals. All in all, I can’t see why eating beets should be a rarity. Nutritious beets are inexpensive; they store well; and they’re available throughout the year. Forget about the numerous health benefits these ruby-coloured foods bestow. Roasting the beets magically brings out a fabulous flavour that you will savour with an overall warm pleasantness that will tickle your innards. Roasted beets can’t be beat. Roasted beets pair well with greens, cheese and nuts. If you haven’t eaten beets in awhile, here is a dish that will make you happy; a zesty, vibrant salad of greens, cheese and nuts that features roasted beets. Heat oven to 400F. Wrap the beets in aluminum foil tightly and .bake for 45 minutes. Remove from oven and let the beets steam for 10 minutes, then open and let the beets cool slightly. Meanwhile, whisk together vinegar, mustard, honey, and garlic in a small bowl. Slowly whisk in the oil and season with salt and pepper. Set vinaigrette aside. · After beets have cooled enough to handle, remove and discard skins and cut into bite-size pieces. · Mix beets with half of vinaigrette, then mix spinach and watercress or radicchio with the rest of the vinaigrette. · Transfer greens to plates and top with beets, walnuts, and gorgonzola cheese. You could add a little fruit to this if you like. Eat a beet this way for your good health, but mostly because it tastes marvelous. I LOVE beets but have never had them roasted. Sounds wonderful. My Hubs was raised not eating many vegetables, when he met me, he started eating lots of vegetables. A couple of years ago, I introduced him to beets. He loved them and ate A LOT! Later, we went to bed, he got up to go to the bathroom and you can guess what happened. He thought he was bleeding from his colon. I kept a straight face and told him it was the beets. Now he knows what to expect if he pigs out on beets. I love beets, even right out of the can, but roasted beets in this saard lad is fantastic. Your spouse is lucky to have you spurring him to eat vegetables. I know what you mean about the colour of urine after eating beets, but I hear not every beet-eater suffers that. I am happy you both love vegetables. Take care. 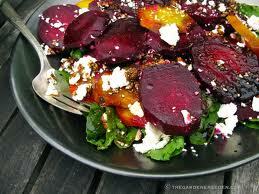 ANITA-RECIPE WITH PICTURES: I'm with you on the roasted beets, Thank You very much for your kind words. I hate to say that I am not a fan of beets (my mom used to MAke me eat them!) but my Hubby loves them and I think this would be something he'd love. Thanks! I love pickled beets on a salad. I pile up on them big time. Gotta be careful as their juice stains. I don't think there's a detergent out there that can remove beet juice stains. I dont actually eat beets but my husband loves them! I ll deffinately try this for him! Beets do make me sad. I have never seen a recipe like this. Fancy!! JOANNE: OK, make this for your spouse- and then just taste a tiny bit, I feel that you will be converted. The aroma alone should entice you. STEPHEN TREMP: You're right about the staining but pickled beets are very good. ELPINIKI: When you make them for him, please try a little, you may be a trifle surprised. MISHA GERICKE: Beets are a beautifully coloured vegetable, that vibrant colour indicates a high amount of antioxidents. When you unwrap the roasted beets you should like the aroma, and then mixed in with the greens et al, you should change your mind and come to like, nay, love, beets, OK? DAWN @LIGHTEN UP! : Forget your beetphobia, come on get happy. Roasted beets will chase your sadness away. With a little prep work you can serve this neglected but wonderful dish. You deserve fancy. Anthony the salad is stunning! Admittedly I am not a big beet fan, but then again I've never paired them with cheese and nuts. Silly me, everything's better with cheese and nuts! Next time I see these gorgeous beauties in the store I'm going to try them again. If they're half as tasty as they are beautiful then they'll be good! They'll be as tasty as they are beautiful and you will love them.Andrea. I used to only eat beets from a can and I was very meh over them. Then I tried fresh beet. Oh wow, what a differnce. So much so, the moment I came to this post and saw the pic I thought, "Oh YUM!!!" I have a beetroot craving now. Yes, interesting. I love, I think this beet dish will be very good. Greetings and happy week. LYNDA R YOUNG: Thank You for calling, your exuberance re (in the matter of) fresh roasted beets is so welcoming. LEOVI: I now that you can appreciate beets as the colour is so appealing to the eyes. After you have devoured them "with your eyes" you can taste their goodness. I've never been a beet person but my mom would love this! I'll pass on to her, thanks as always for the ideas! And you can't beet that! I love beets. This sounds like a great recipe! Wow....roasted beets..they look awesome ! I love beets and have had them in salads as well, with walnuts and feta. The blue cheese is something I would like, the baby spinach as well. The raspberry vinegar is an interesting tist, because the beets have their own sweetness thet the vinegar could complement. You asked last week about our French luncheon...many dishes including Coq au Vin, Pork pie, ratatouille, crepes, madeleines, apple tatin and more...tres delicieux! ALEXIS AKA MOM: I know that you must look up to your mom, so if she loves beets won't you try them again, for her? AL PENWASSER: Thanks and no you cannot. THE GOLDEN EAGLE: Yes, this is a winner. CLAUDIA DEL BALSO: Thank You for your lovely words. Beets are underrated but shouldn't be. SONALI PRADHAN: You're right,roasted beets are fabulous.Thyanks for calling. ALEX: Glad to hear from you, I see where you are moving your blog, I hope I can still reach you. The feta is very good also in this. JOYCE: Happy to hear you like beets. Man alive, that le dejeuner you had sounded wonderful. I haven't had coq au vin in years, maybe I'll cook some next week. Thank You for telling me. looks so fresh and healthy...the recipe is perfect to prepare and taste this nutritious vegetable anytime. TORVIEWTORONTO: It is a lovely combination. KALYAN P: I couldn't agree more. Thank You. DEEPS @ NAUGHTY CURRY: You right, more people should be eating beets, and yes, raspberry vinegar is great. wow..this is one interesting beetroot recipe..will surely try this sometime...yumm!! JISHAS KITCHEN: You will love this recipe for sure. TEENA MARY: You are welcome, I'm happy you loved the recipe.